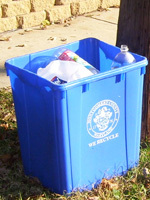 22-gallon recycling bins are used for bottles, cans, containers, and jars. Bin disappeared from the curb. There was no bin at this address when I moved in. I have more recycling than my current bin can hold. You may order up to 2 bins per year. If you would like to request a repair or replacement of your mixed paper wheeled cart, you may call 311 (240-777-0311) as cart service fulfilment is separate from 22-gallon bin service. These 22-gallon bins are for single-family and townhouse residents who receive Montgomery County-provided recycling service. Check whether your recycling service is County-provided. If you live in a municipality, contact your local officials to request a recycling bin. How many bins may I order? If you receive recycling collection service from Montgomery County, Maryland, we provide and deliver these bins free of charge. When will I get my new bin? We will place your new bin near your door or garage. You do not need to be home to receive it. Blue bin deliveries are made by County staff, not by your recycling collection crew. They may happen any weekday, and not necessarily on your recycling day. How do I recycle until my new bin arrives? Collect your recyclables in a small cardboard box. If we haven't delivered your new bin by your recycling day, set the cardboard box out at the curb, just as you would do with your bin. Will you pick up my old bin? Yes. In fact, we recycle the broken bins we collect. Request pickup of your old blue bin.